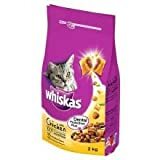 Whiskas Complete Chicken is a complete pet food for adult cats with 100% complete nutrition. Whiskas put all of their passion and know-how into creating the meals they prefer. With dental protection plus it is specifically designed with a formulation that supports healthy teeth and a texture that provides a gentle abrasive effect to help clean your cats teeth. This entry was posted in Uncategorized and tagged Chicken, Complete, Whiskas by One Boutique. Bookmark the permalink.